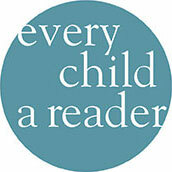 Every Child a Reader is a 501(c)(3) nonprofit dedicated to inspiring a lifelong love of reading in children and teens across America, and is supported by individual donations, grants, foundations, and the Children’s Book Council. Children’s Book Week is the annual celebration of children’s books and reading. Established in 1919, it is the longest-running national literacy initiative in the country. The Children’s & Teen Choice Book Awards is the only national book awards program where the winners are selected by kids and teens of all ages. The National Ambassador for Young People’s Literature is the United States’ “Children’s Literature Laureate.” Established in 2008, the program is co-sponsored by the Center for the Book in the Library of Congress and the Children’s Book Council. Every Child a Reader understands that it is not enough for children to learn to read — it is essential that they enjoy their personal and shared reading experiences so that they will nurture those skills for the rest of their lives. Every Child a Reader’s vibrant national programs connect kids with their favorite books and authors to create meaningful experiences that will instill a lifelong love of reading at zero cost to kids and caregivers.